- Publisher Scholar and teacher Paul Wesley Chilcote provides a full and clear introduction to the dynamic faith of John and Charles Wesley. The vital theology of John is skillfully gleaned from his voluminous writings. The corresponding faith of Charles is culled from his enduring hymns.For students and general readers this book illuminates the vital balance the Wesleys found in Christian teaching that overcomes the often mutually exclusive options presented in other theological traditions. Chilcote shows that such a synthetic faith is not boring or irrelevant but transforming and life-giving, bringing together faith and works, Word and Spirit, the personal and the social, the head and the heart, mission and service. - Publisher "Paul Chilcote writes a highly readable book that focuses and synthesizes the essence of Wesleyan theology. He presents experiences of the Christian life--including personal and social salvation, a person's inner relationship with God and the rituals of the church, and a renewed heart and outward good works--to demonstrate that they are not opposed to each other but are complementary for a mature faith in Christian community. Sermons of John Wesley and hymns of his brother, Charles, provide examples and grounding for Chilcote's themes. Questions at theend of each chapter make this an excellent individual or small group study resource. Both laypersons and professionals in the church who seek to get to the heart of Wesleyan theology--and their own--will find this book useful." 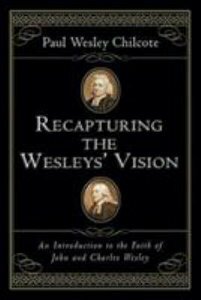 About "Recapturing the Wesleys' Vision"
Scholar and teacher Paul Wesley Chilcote provides a full and clear introduction to the dynamic faith of John and Charles Wesley. The vital theology of John is skillfully gleaned from his voluminous writings. The corresponding faith of Charles is culled from his enduring hymns.For students and general readers this book illuminates the vital balance the Wesleys found in Christian teaching that overcomes the often mutually exclusive options presented in other theological traditions. Chilcote shows that such a synthetic faith is not boring or irrelevant but transforming and life-giving, bringing together faith and works, Word and Spirit, the personal and the social, the head and the heart, mission and service. "Paul Chilcote writes a highly readable book that focuses and synthesizes the essence of Wesleyan theology. He presents experiences of the Christian life--including personal and social salvation, a person's inner relationship with God and the rituals of the church, and a renewed heart and outward good works--to demonstrate that they are not opposed to each other but are complementary for a mature faith in Christian community. Sermons of John Wesley and hymns of his brother, Charles, provide examples and grounding for Chilcote's themes. Questions at theend of each chapter make this an excellent individual or small group study resource. Both laypersons and professionals in the church who seek to get to the heart of Wesleyan theology--and their own--will find this book useful." Paul W. Chilcote is professor of historical theologyý and Wesleyan studies and director of the Center forý Applied Wesleyan Studies at Ashland Theologicalý Seminary. He also serves as president of Theý Charles Wesley Society, an international organizationý devoted to the preservation and disseminationý of the prose and poetic writings of this Anglicaný priest and highly acclaimed hymn writer. He is theý author of many books, including Recapturing theý Wesleys' Vision: An Introduction to the Faith ofý John and Charles Wesley.